This nice oval box is a creation of Vladimir Kiselyov. It continues his series of works dedicated to the fauna of Russia, and shows the woodpecker sitting on the tree. The scene shows a unique painting style of the honored Kholui artist. The bird is painted in the realistic style. The palette is dominated by greens and browns. 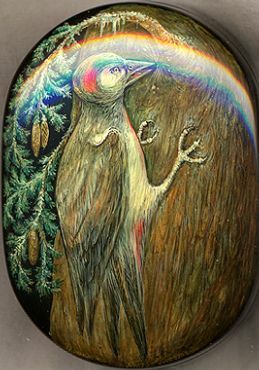 This rather monotonous color palette is enlivened with gold highlights that can be found on the tree, and the bird's feathers. The box's exterior is decorated with elegant gold and silver ornaments.